Recent comments by Paul and Terry in their suggestions for an interim AMICON standard have shown me that I have been lax in properly describing the "dynamic addressing" system. Here are some specific comments on comments! 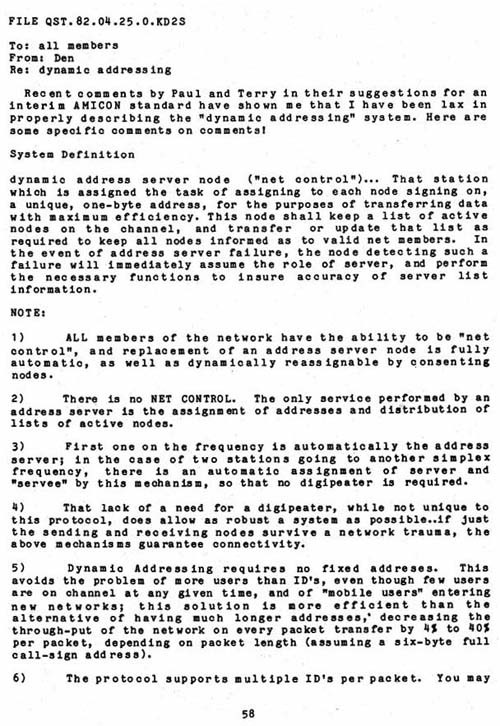 dynamic address server node ("net control")... That station which is assigned the task of assigning to each node signing on, a unique, one-byte address, for the purposes of transferring data with maximum efficiency. This node shall keep a list of active nodes on the channel, and transfer or update that list as required to keep all nodes informed as to valid net members. In the event of address server failure, the node detecting such a failure will immediately assume the role of server, and perform the necessary functions to insure accuracy of server list information. 1 )	ALL members of the network have the ability to be "net control", and replacement of an address server node is fully automatic, as well as dynamically reassignable by consenting nodes. 2) There is no NET CONTROL. The only service performed by an address server is the assignment of addresses and distribution of lists of active nodes. 3) First one on the frequency is automatically the address server; in the case of two stations going to another simplex frequency, there is an automatic assignment of server	and "servee" by this mechanism, so that no digipeater is required. 4) That lack of a need for a digipeater, while not unique to this protocol, does allow as robust a system as possible..if just the sending and receiving nodes survive a network trauma,	the above mechanisms guarantee	connectivity. 5) Dynamic Addressing requires no fixed address. This avoids the problem of more users than ID's, even though few users are on channel at any given time, and of "mobile users" entering new networks; this solution is more efficient than the alternative of having much longer addresses,' decreasing the through-put of the network on every packet transfer by 4% to 40% per packet, depending on packet length (assuming a six-byte full call-sign address ).